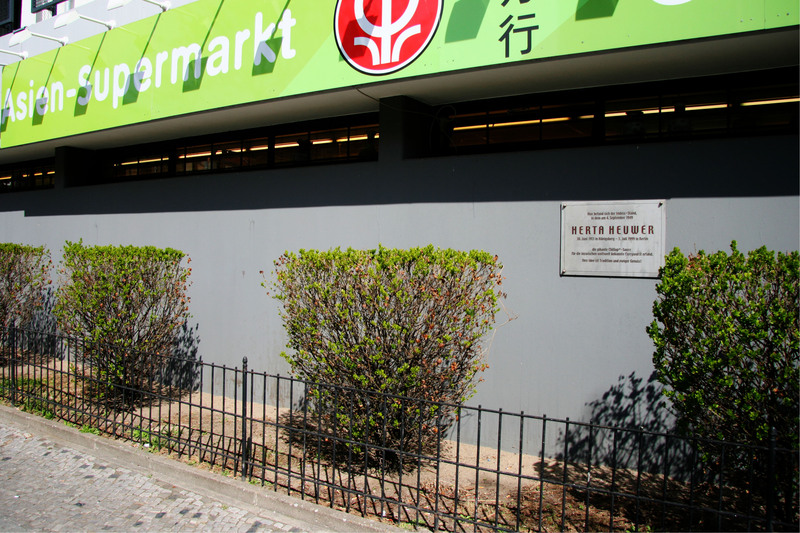 Why you may ask am I posting a photo of an Asian Supermarket on a blog about Berlin? If you look a little closer you may see the reason. 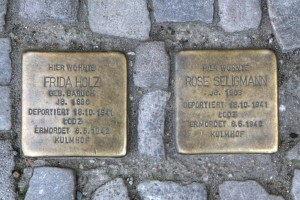 When I found out there was a plaque honouring the inventor of the Currywurst, Herta Heuwer (from a SugarHigh newsletter), with my love of the humble Berlin snack, it was only a matter of time before I went on a pilgrimage. Tucked away on the side of a supermarket on the corner of Kaiser-Friedrich-Strasse and Kantstrasse, the plaque is not likely to be seen by the casual observer. When I was trying to find out more about the origins of the Currywurst for my Konnopke’s Imbiss post I found the following excerpt on Wikipedia (you can read the full article here). 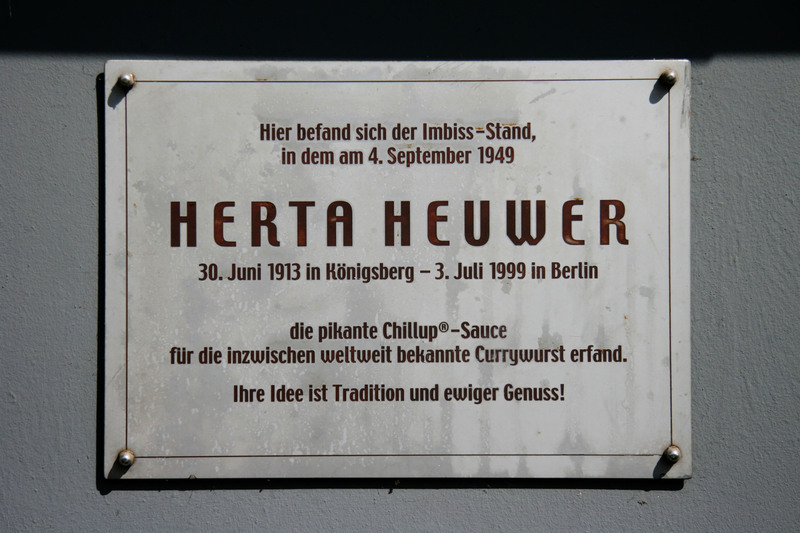 The invention of currywurst is attributed to Herta Heuwer in Berlin in 1949 after she obtained ketchup, Worcestershire sauce and curry powder from British soldiers. She mixed these ingredients with other spices and poured it over grilled pork sausage. Heuwer started selling the cheap but filling snack at a street stand in the Charlottenburg district of Berlin where it became popular with construction workers rebuilding the devastated city. She patented her sauce, called Chillup, in 1951. At its height the stand was selling 10,000 servings per week. 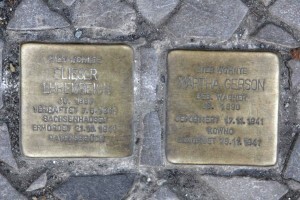 If you do check out the Herta Heuwer plaque you could get yourself another Berlin snack staple, a Döner Kebap (or Doner Kebab), from Efes Bistro, which is just a couple of hundred metres away. Very intriguing. I love the little details that help us to fall in love with a place, especially a city! I’m glad you like it. It takes a while to notice some of the details when a place is new so it’s great when you get to know somewhere well enough to spot them. 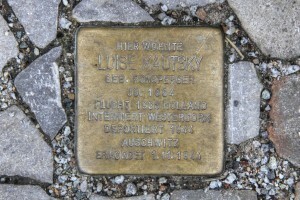 The more I see of Berlin, the more I love it and there are plenty of little details to fall in love with! 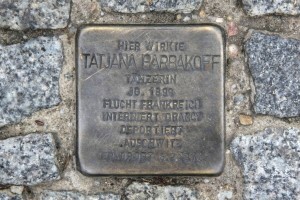 I have heard as much about Berlin. I am and always have been fond of U2’s album that was written there. Still one of their best! It’s funny how certain details jump out to certain people, though. And it’s funny what a city prides itself on over time, unassuming or not.